The APC Series is excited to welcome back Spira Fire Protection Ltd. as the sponsor for the August long weekend event at Sauble Speedway. The race will take place on August 5th 2017 and continue the extensive tradition of late model racing at the speedway for the long weekend. The naming of the event will reclaim the traditional name and become the Spira Fire ProtectionBeat the Heat 100. Spira Fire Protection has a long history supporting short track racing in Ontario whether it be the sponsorship of cars, events and more. Spira has been partnered with APC series since the inaugural season and shows its support in many ways, including this event sponsorship and sponsoring full time series drivers such as 2015 Rookie of the Year Billy Schwartzenburg and longtime late model racer Steve Laking. The 2016 Spira sponsored event at Sauble saw Brandon Watson take the victory while in a substitute role for Nick Goetz and his #24. Bringing the #10 machine 2nd was local favourite Tom Gibbons for his first career podium, and rounding out the top 3 was Spira driver Steve Laking and his #44. 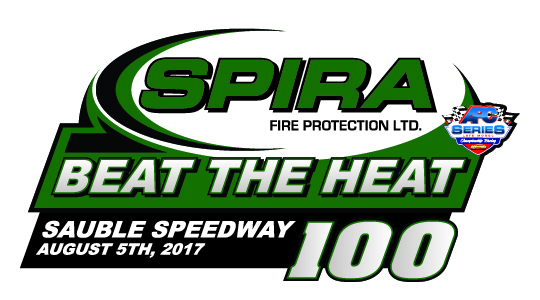 The APC series looks forward to this fantastic event during the August long weekend and are proud to welcome the return of Spira Fire Protection Ltd. as the official event sponsors for the Spira Fire Protection Beat the Heat 100!